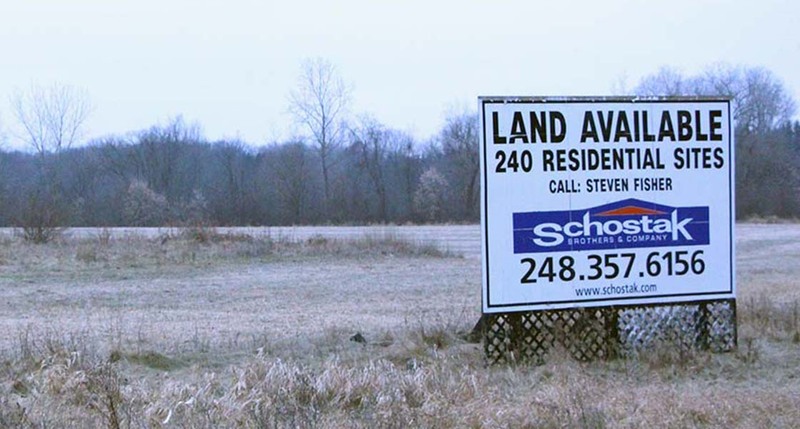 Developers Schostak Brothers & Co. are hoping to build a mixture of residential and commercial buildings on over 560 acres in Salem Township, off the Gotfredson Road exit of M-14 in eastern Washtenaw County. Legislators recently gave the township $10 million to help install water and sewer lines. In the last two years, Michigan lawmakers slipped $20 million in grants for water and sewer lines into billion-dollar spending bills. Both times, first in 2017 and again on the last day of the Legislature's lame duck session in December 2018, little documentation accompanied the grants after they were approved by lawmakers. Unlike other “special grant proposal” forms filled out by lawmakers, the names of the sponsors of the utility line grants are blank and there’s no indication why the funding is necessary. Those details may be missing. But the grants’ main beneficiary is known: Bobby Schostak, former chairman of the Michigan Republican Party, who has raised hundreds of thousands of dollars for his party and its political candidates. The grants will fund utility work to support development on largely vacant land in Salem Township near Ann Arbor, about a third of which is owned by Schostak’s company, Schostak Brothers & Co.
State Rep. Donna Lasinski, D-Scio Township, represents the area and has tried – and failed – for two years to get answers about which lawmakers pushed for the grants. “I don’t think it was (that) no one wanted to take credit, I think no one wanted to take blame,” she said. Bridge Magazine reviewed three dozen special grant proposal forms, and almost all listed sponsors. The vast majority fund community projects such as fixes to an armory in Owosso, bridge repairs in Alpena, money for school safety in Van Buren County and parks in Inkster and Rochester Hills. The money for water and sewer lines in Salem Township is also unique because it will directly benefit a private developer – and because elected officials in the community such as Lasinski didn’t request the money. Michigan lawmakers complete “special grant proposal” forms after they approve grants explaining who sponsored the measure and why the funding is necessary. A form allocating $10 million for water and sewer lines in Salem Township, however, listed no sponsor. The lines will bring utilities to land owned by Schostak Brothers & Co., whose CEO, Bobby Schostak, is the former chairman of the Michigan Republican Party. Read the grant form for the project, however, and it appears Salem Township officials support spending public money to bring the lines to an area along M-14 near Gotfredson Road. The 2017 form lists Salem Township Supervisor Gary Whittaker as the contact. The township not only did not initiate the request for money, it has fought Schostak for years, sometimes in court, over bringing public utilities to the property. But Salem Township has begun spending the 2017 grant money on preliminary engineering work, Whittaker said. “I just feel we’d be in a lawsuit if we said no,” he told Bridge. There is no form for the 2018 grant approved in December, and state officials said there likely wouldn’t be one because it’s a continuation of the 2017 grant. Since Bridge first reported on the grants last week, several lawmakers have denied sponsoring the grants, and none has identified themselves as the sponsor. Lasinski, the state representative, said she believes the form was intentionally kept blank because of Schostak’s ties with the Republican Party. He served as chair of the state party from 2011 to 2015 and is CEO of Schostak Brothers. The company owns over 560 acres of the land slated for development that would be serviced by the water and sewer lines funded by the $20 million in grants. Whittaker said the total cost will be $30 million, with developers expected to pick up the balance. Public records and the Schostak Brothers’ website indicate the company plans 800 homes north and south of M-14 and “big box” retail, according to public records and information from the company’s website. Schostak told Bridge Magazine this month the grants will help bring jobs and tax revenues to the community. “We raised (the grant) as an option with state policy makers and appreciate their support for this kind of infrastructure and economic development project that can help strengthen the community and support families and schools,” he wrote Bridge in an email. For much of the last 20 years, grants like those approved in 2017 and 2018 have been rare. There was either little money in the state budget or a Democrat-Republican split between the governor and Legislature made such special grants difficult to pass. But in the last few years, Michigan has had budget surpluses – and single-party leadership of Lansing, with Republicans controlling both the Legislature and governor’s office since 2010. That’s led to dozens of grants and nearly $200 million in spending on parks and roads and museums, all pet projects of different legislators. In the actual legislation, the grants are awarded to communities and the reasons are often vague: for “park improvements” or “cultural center” and identified geographically by the size of the population. It’s up to state budget officials to unravel the true intent, and legislators have obliged by submitting special grant proposal forms that detail how the grant money should be spent, said Kurt Weiss, a spokesman for the Department of Technology, Management and Budget. The forms helped state officials, for instance, determine that money for “infrastructure” in Nottawa Township in Isabella County will help build sewers in unincorporated Beal City, where the state has found illegal discharges into a county drain. Rep. Roger Hauck, R-Union Township, who grew up in Beal City, sponsored the legislation and has been proud to tout that grant. So too, are most lawmakers: In almost every grant proposal reviewed by Bridge, legislative sponsors list their names. The forms include projects from a Who’s Who of Republican leadership from the last session: House Majority Floor Leader Dan Lauwers, Senate Majority Leader Arlan Meekhof, and appropriations committee chairs, Sen. Dave Hildenbrand and Rep. Laura Cox. Only Lauwers is still in the legislature. But the Salem Township project had no defender. The state budget office provided Bridge with documentation for 37 grants in both 2017 and 2018. All told, 33 of 37 grants had a legislative sponsor. Beside the Salem grant, two projects had no backup documentation and a fourth, for a project in Wayne County, did not list a sponsor. Republican Rick Jones, who was in the state Senate in 2017 and 2018, said he was told by fellow Republicans the Salem Township grants would spur economic development and jobs. He said he was not told the Schostak company stood to benefit. Had senators known, it might have been a problem, said Jones of Grand Ledge. “It bothers me that it was a last minute thing and there wasn’t more discussion,” Jones said. There wasn’t much discussion because there was so little time: On Dec. 21, most legislators didn’t know about the grant’s inclusion in a $1.3 billion bill until after midnight; it was approved about 8 a.m. that day. And in 2017, the first $10 million grant was added at the last minute, eliminating the opportunity to review the grant – or any of the grants. Lasinski, a Democrat, said the Salem Township grant would likely not have survived the more traditional legislative process that includes committee hearings and a review by legislative analysts. “If this had come before a committee, there is very little likelihood …. this would have passed muster,” Lasinski said. She said she’s upset the state will spend $20 million to “subsidize a for-profit developer and prefers them over other developers,” she said. Nor does Larry Merrill, the executive director of the Michigan Township Association. He said the state has typically only helped with infrastructure for residential development in cases of environmental safety, where wells are contaminated or septic fields have failed, for instance. Former Gov. Rick Snyder vetoed only one grant in December, which would have funded improvements to a Kroger dairy plant in Livonia. Snyder’s reasoning for killing the funding: “It was $2 million for a specific private company,” a Snyder spokesperson told reporters. This is pure corruption, the theft of public funds for private benefit. I'd like to see an investigation by our Attorney General's office. So much for transparency. Maybe we, the taxpayers, should initiate a lawsuit claiming we have been defrauded of $20 million. Interesting demographics on the subject jurisdiction. Source: Wikipedia. There were 1,928 households ... The average household size was 2.88 and the average family size was 3.13. The median household income was $69,258 and the median family income was $75,115. ... The per capita income for the township was $29,450. About 0.8% of families and 2.2% of the population were below the poverty line, including 3.5% of those under age 18 and none of those age 65 or over. The Michigan GOP - the crime pays party. Crony capitalism at its worst. The Republican Party simply took advantage of an opportunity made possible by the voters of Michigan. First, the electorate of our two peninsulas passed term limits, which meant that many office holders would be forced to leave the legislature each year. With no prospect of being able to run for their seat again, these outgoing politicians could vote without fear of electoral retribution at the mandated end of their terms. Next, those citizens who went to the polls foolishly put all of Michigan government (executive, legislative and judicial) in the hands of the GOP and expected these politicians to act responsibly and not for the interests of their own kind. The results of the balloting in 2018 showed that many voters in our state now realize the error of their ways, but it will take at least one more corrective election cycle before there are no more shenanigans like the one described in this story. Poor reporting. Anyone who has worked with municipalities knows that sometimes money is needed for the basic infrastructure to open up land tracts, whose internal infrastructure is paid for by the developer who then passes it on the lot or home buyers. That is just how it works. No developer is in a position to fund a mile or two of trunk infrastructure just to get to his property! Yes it is possible for the township to float a bond to address this cost which would then be retired with the new taxes that are generated with the new development. If instead you can get a grant, then go for it. Part of the political give and take. But the bottom line is that it is the township that benefits. Quit beating up on developers. Typically public utilities are extended in a logical fashion, say to an existing hamlet with many established residences on well and septic. Or to an area where contamination has been discovered. This is state money going to an undeveloped area for the benefit of a landowner who can probably well afford to implement his own improvements. If you take a look at the census data (easily found on Wikipedia, among other sites), it's clear that the ~6000 people living there are not in desperate need of housing units, big-box jobs, and municipal infrastructure. Again, this is state money being paid to a private entity. For comparison's sake, the city of Flint still does not have clean drinking water. You can follow the water line replacement program in Flint at a page called "FAST Start." Huh...so when the free market doesn't work for development companies -- most of whom are LLCs, which means they pay NO STATE BUSINESS TAX -- they go all socialism on us? If this is how the system is going to work, let's at least socialize the profits as well as the risk. If they development is a success, the community and state should get a negotiated percentage of the profits. And as noted...in this case, the community doesn't want the development. This is how we get sprawl...state subsidizes rural development, and not municipal development. Will the State of Michigan pay for my well and septic system given the fact that my property taxes will reimburse the State in four years? Since there is no sponsor, certainly there would be no one to object if the money were cut off. Do it. If anybody wonders why the GOP is so afraid of democracy (see yesterday's Bridge article about how they are frantically trying to maintain their gerrymandered state legislative districts)... here's Exhibit A. Only a corrupt and unaccountable one-party system can push through dirty deals like this. As a moderate conservative, I've been devastated to see the GOP turn so strongly to organized crime. I know no other words that so perfectly capture the utter lack of morality involved with the myriad greed-soaked back room deals they do on a State and Federal level. They have not had my vote since 2014 and will not for the foreseeable future. I don't agree fiscally with much the Democrat party does, however I'd rather have someone in office who cares about their constituents (even if they don't take the same action I would) than a party that wields its power over constituents. The Legislature should repeal the Shostak grant now. The voters should abolish Lame Duck by constitutional amendment. And the Governor should announce that she will veto any bills passed after September 30, 2020, unless she has specifically requested them. The water project goes back at least 20 years, and was first initiated by Johnson Controls who wanted to move their world HQ to a site that needed water. Then a Race track was proposed, then Schostak jumped on the bandwagon, until the Johnson Controls project went away, as did the racetrack, leaving Schostak as the last company standing. As you can see the entire GOP are both corporate prostitutes and totally corrupt. Sounds like this is being done TO THE PEOPLE of Salem Township; not FOR THE PEOPLE of Salem Township.......! Reading the MLive piece took me to this one. Apparently they'll 'fess up to Crain's.